The winter is a fun time for everyone in your family, even your four-legged pals. However, it is important to remember that your dog may require some extra TLC in the extreme cold. They might refuse to go outside for a walk or bathroom time unless you clear a path for them from the front door down to the sidewalk, for instance. Here are a few suggestions for what you can do for your pooch this winter. The polar vortex is causing conditions that are dangerous and even fatal to humans. The same goes for our dogs. Look out for their paws. Their legs, tails, and ears are most vulnerable to the effects of frostbite, so play around with the idea of giving them a hat and some special boots, if not a sweater. Even if your dog hates human clothes, they’ll be better off if you bundle them up. In the winter, we all want to hibernate. You may start to notice that your dog has less energy than normal. Make meal time fun by turning it into a treasure hunt around the house, or load up a toy that can bounce and wobble away, dropping food as it goes. Whenever you do go outside, don’t let your dog off the leash. 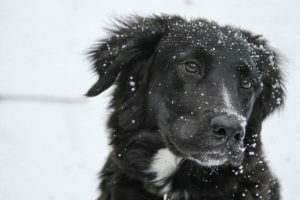 Even if you think that no one is nearby, you can never be sure if your dog will be aggressive towards unfamiliar animals and people that you may encounter. Besides, you don’t want them getting hurt or lost if they wander off. Keep your walks outside short, because as cold as it is, both of you won’t be enjoying the experience for long. We Would Love the Opportunity to Care for Your Furry Friends! Alexander Animal Hospital is a full-service animal hospital located in Severna Park, Maryland, serving the Severna Park, Pasadena, and Arnold Areas. Our goal is educating clients on the needs of their pets and understanding the importance of individualized veterinary care in order to strengthen the human-animal bond between owners and their pets. We understand you have a choice when deciding on the care for your pets, and we strive to provide you with unparalleled services including wellness exams, vaccines, lost pet microchip ID, dental care, surgical services, digital radiography, and in-hospital laboratory services and diagnostics. Other highlights of Alexander Animal Hospital are the separate cat and dog waiting and exam rooms, as well as after hours on-call emergency services. Please take a look around our website and then give us a call at 410-777-8678 to set up an appointment. We’re social! Follow us on Facebook, Twitter, and Pinterest for all the latest updates! This entry was posted on Friday, February 1st, 2019 at 1:12 pm. Both comments and pings are currently closed. What Do I Feed My Dog when They Have an Upset Stomach?